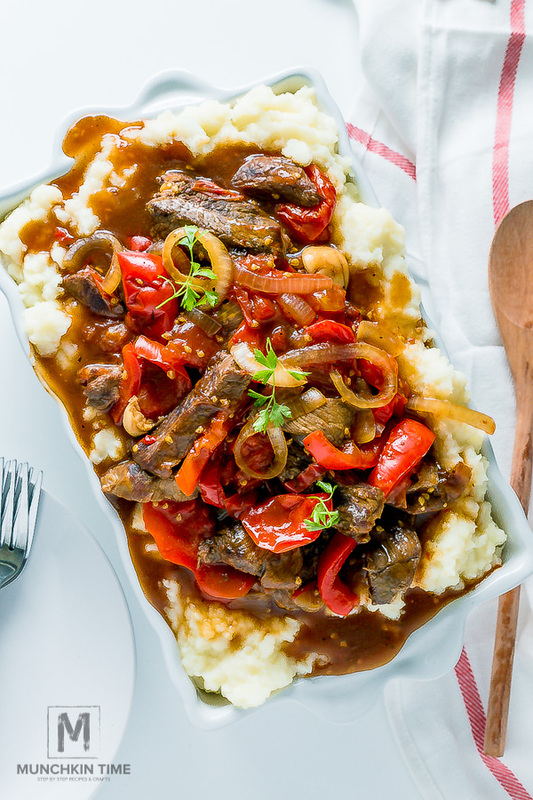 Crock Pot Pepper Steak – tender beef sirloin slowly cooked in thick flavorful sauce. 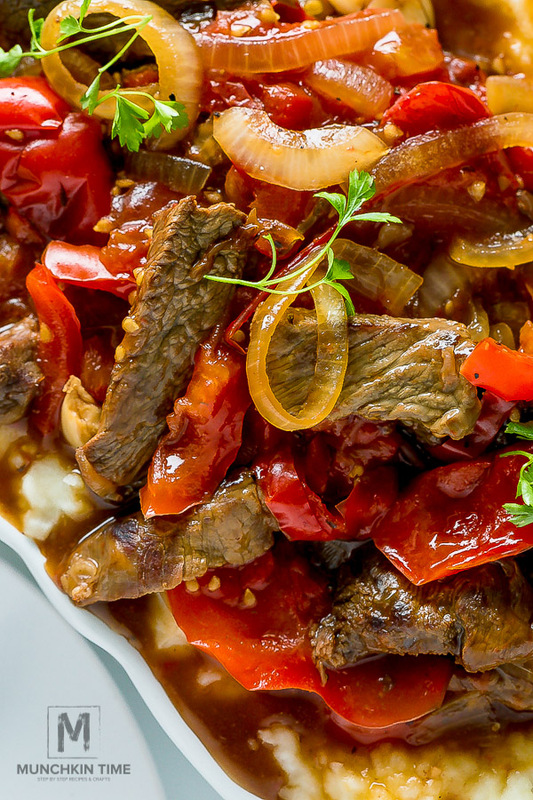 This easy slow cooker dinner recipe is made of steak seasoned in Montreal steak seasoning, red bell peppers, ripe tomatoes, beef broth and other amazing ingredients. 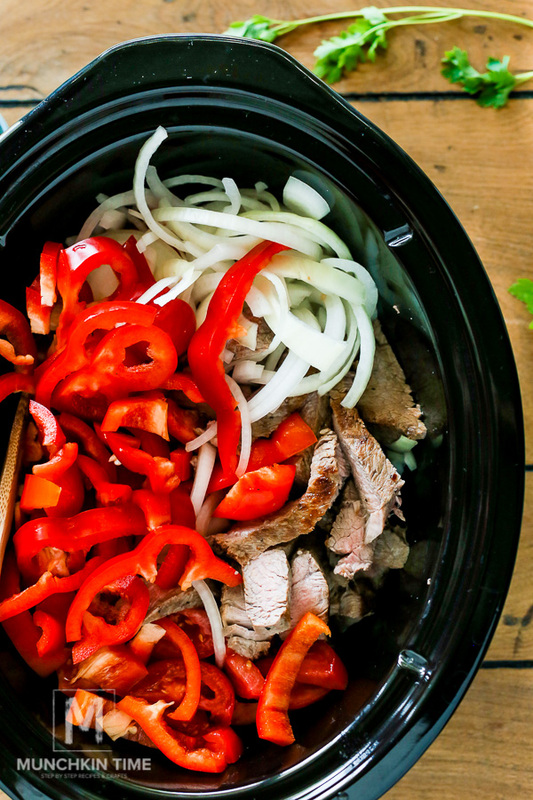 All you need to do is brown steak on a skillet, slice it and place it in the crock pot with the rest of ingredients. Cover and let it cook for you. Doesn’t it sounds easy!?! It’s super easy and delicious, I am sure you will like it as much as my family does. This recipe is worth a try! 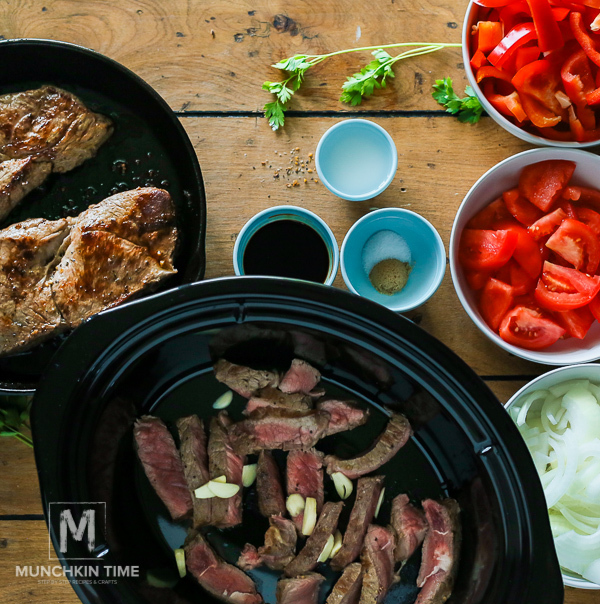 If you make Slow Cooked Beef Recipe would you take a picture and share it on Instagram by tagging @munchkintimeblog I would LOVE to see your creation ???? Thank you! 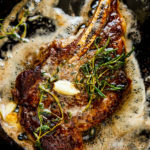 Remove extra fat from the steak and season both sides with Montreal seasoning. On medium heat, in the cast iron or big skillet heat olive oil. Add steak and cook on both sides until beautiful brown color. 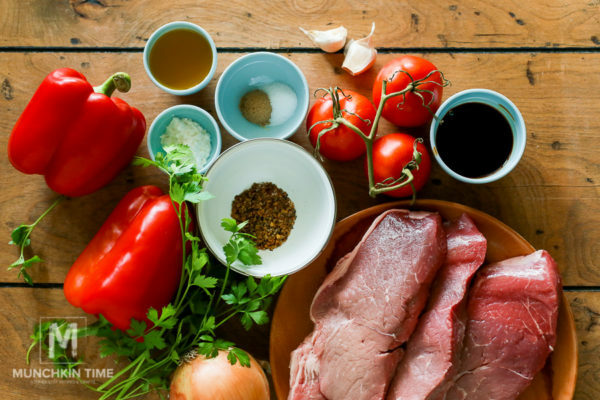 Slice the meat and transfer to a crock pot. 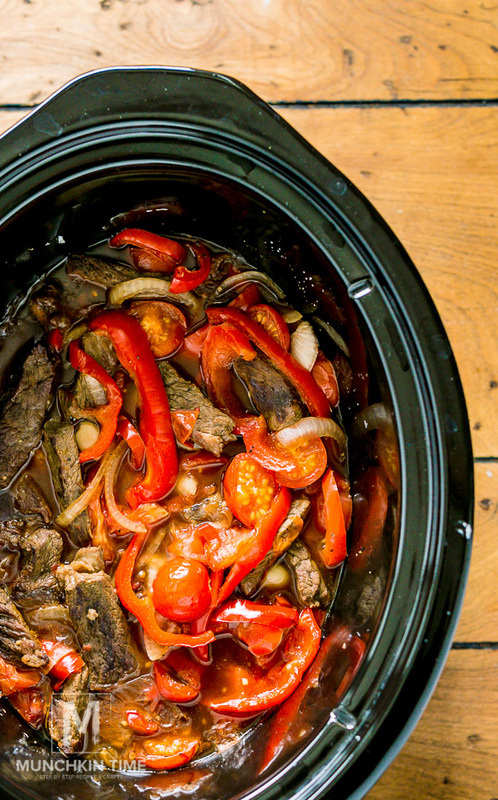 Mix water with cornstarch then pour it into the crock pot. Add beef broth. Add garlic, bell pepper, tomatoes, onion, soy sauce, sugar, salt and pepper. Give it a good stir. Cover and cook on High for 3 – 4 hours, or cook it on Low 6 – 8 hours. Serve with hot spaghetti, sticky rice or mashed potatoes. Enjoy! 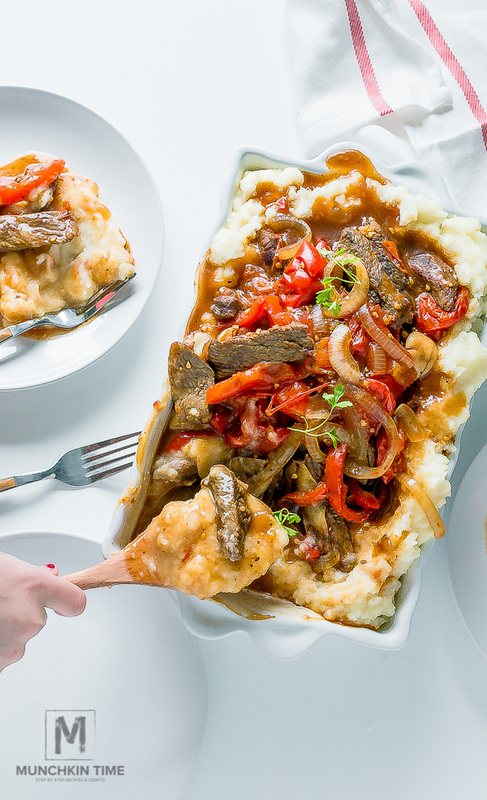 Tender Crock Pot Pepper Steak in amazing thick sauce. 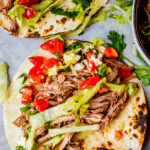 Easy dinner recipe for busy moms. Mix water with cornstarch then pour it into the crock pot. Add beef broth. Add garlic, bell pepper, tomatoes, onion, soy sauce, sugar, salt and pepper. Give it a good stir. Cover and cook on High for 3 - 4 hours, or cook it on Low 6 - 8 hours. 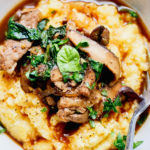 Serve with hot spaghetti, sticky rice or mashed potatoes. Enjoy! Hi! All content & images are copyright protected. Please do not use my images without prior permission. 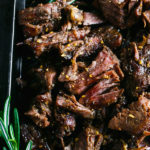 If you want to republish this recipe, please re-write the recipe in your own words, or simply link back to this post for the recipe. Thank you. Q. – Did you like Crock Pot Pepper Steak Recipe? Let me know in the comments below, I would love to hear from you! Don’t miss another great recipe subscribe to Munchkin Time <— HERE! Huge thank you goes to Fred Meyer Stores for sponsoring this recipe! Thank you Ashley for the recipe review! I am so glad you like this recipe! I made this tonight in my knock off instant pot. I sautéed the meat, added the garlic and 3/4 of a tin of petite diced tomatoes, beef broth, other seasoning and salt & pepper. Used pressure cook setting for 20 minutes and let it naturally release for 10, then quick released the rest. Thickened with tapioca flour (gluten free) and adjusted seasoning. I have a thing with mushy veggies, so I sautéed the peppers and onions on the side, served with white rice. My husband almost cried he was so happy. It reminded him of what his mom cooked for his brothers birthday every year. The meat kept its shape while being amazingly tender. Wow, April! Thank you so much for sharing your recipe adjustments and review! 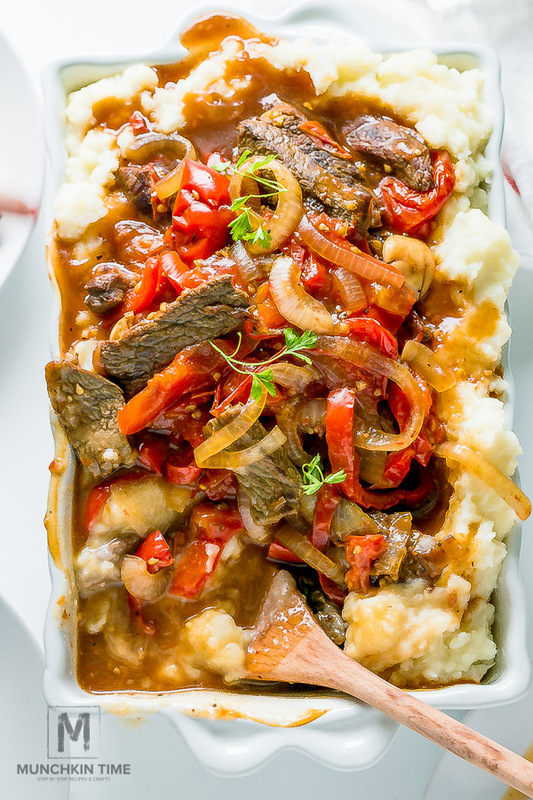 I am so happy to hear that your husband like this Crock Pot/ Instant Pot Pepper Steak, it is amazing how it reminds him of what his mom cooked for his brothers birthday every year! What a surprise!!! 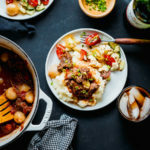 Thank you so much for sharing this, it is one of the best recipe reviews! Best wishes, Love! 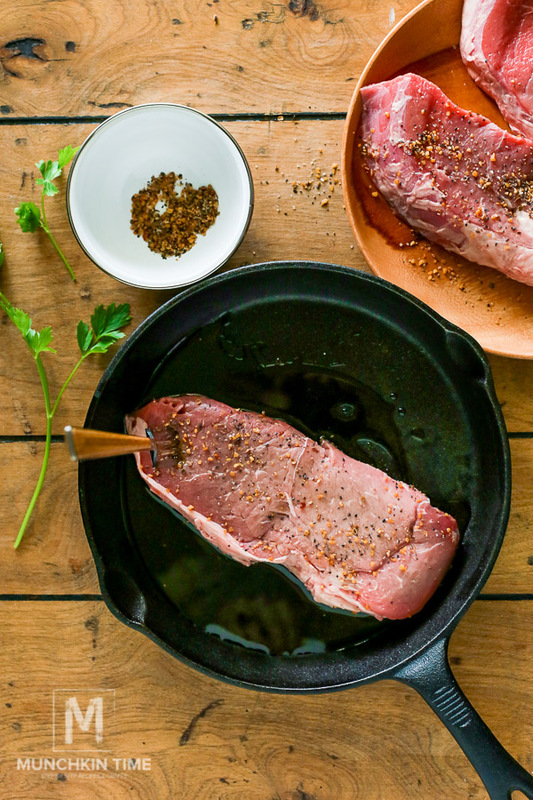 What is Montreal steak seasoning? Never heard of it here in CA. Hi Barbara! 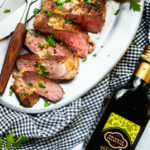 You can find Montreal steak seasoning in any food stores like Fred Meyer, Safeway, Albertsons, or Walmart in the spices area, I hope that helps! 1/2 cups of beef broth or some other measurement? Hi Julia! Yes it is 1/2 cup beef broth. Thank you so much for asking I will update the recipe. Hello! It says 1/2 beef broth. Is that 1/2 cup of beef broth or some other measurement? Thank you! What kind of tomatoes did you use cause there two different types with the pictures? Hi Jen! This is a very good question, I used what I had in my fridge which were cherry and tomatoes on the wine. It’s in the crockpot!!! I’m sure it’ll be delicious!